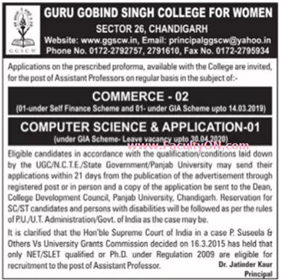 Guru Gobind Singh College for Women, Chandigarh has advertised in Tribune newspaper for the recruitment of Assistant Professor jobs vacancies. Interested and eligible job aspirants are requested to apply with in 21 days. Check out further more details below. About College: Guru Gobind Singh College for Women, named after the tenth Sikh Guru, was established in 1973 by the Sikh Educational Society with the primary mission of providing quality education to women. To realize its mission, the college is imparting value based education to young women synthesized with their intellectual, spiritual, social and physical development so that the quality of their life can be enhanced. In the last almost four decades of its existence, the college has made utmost endeavors to train individuals to become responsible citizens of the globalized world.